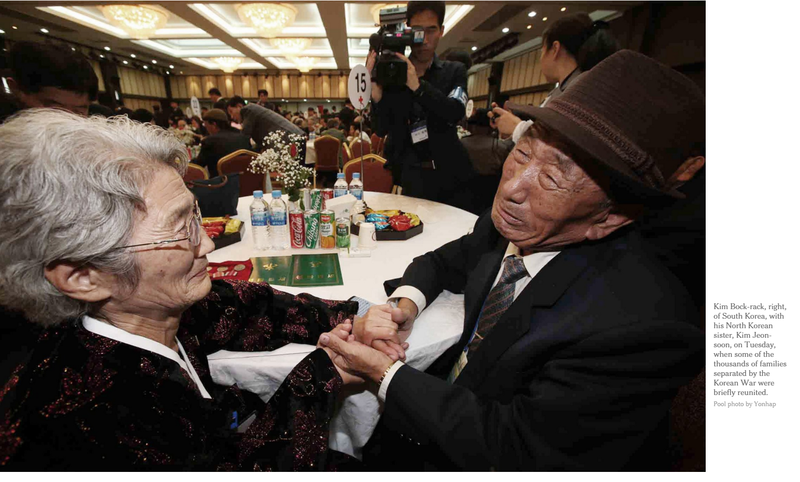 On Tuesday, the Koreas held a meeting at a infamous resort in North Korea for families separated by the Korean war. For some, this meant seeing faces and hugging people they haven’t seen in 65 years. Brothers, sisters, husbands, wives, sons and daughters laying eyes on each other for the first time in an absurd amount of time. I don’t even know how to fully process this kind of separation. The piece by Choe Sang Hun (who, might I add, is an alumni at the school I teach at and just an overall amazing journalist that perfectly captures Korea and its culture for New York Times readers) is sad, emotional, sweet and even captures the hard-shells the older Korean generation sometimes wears; no doubt formed by the tough lives they’ve led. In a culture that puts family first (they even write their family name first) this must be absolutely gut-wrenching for the parties involved. I could feel their pain by reading Choe’s excellent piece and watching the videos with it.. Even still, I sit millions of miles from that experience. The pain I feel certainly doesn’t touch what these people have carried for years. Oddly, the more time I spend in South Korea the more I forget about the DMZ. Fighter jets whoosh over my office and apartment all the time and the news is filled with stories about North Korea and the fear that surrounds it. But, admittedly I’ve become desensitized to living in a country still technically at war. When I first arrived here I nearly ran for cover the first time a jet flew low overhead. Now if I am in class I pause, let it fly over and continue where I left off. Then this piece comes out. The tears, the heartbreak, the forced separations brings the reality back. It reminds me how innocent people are victims of power and corruption. Many of these people were living quiet lives one day and then thrown into a mess not of their making the next. It also reminds me that even with these very real sad stories as cautionary tales, more will be written. That this will not be the last time something like this happens, I believe, is a real tragedy. Previous Post Who Wrote Your History Book?